The chairman of Deltec Bank & Trust finally publically confirmed their relationship with stablecoin issuer Tether. The legitimacy of Tether has long been in question, especially in regards to the USD reserves that Tether claims to have backing its tokens. 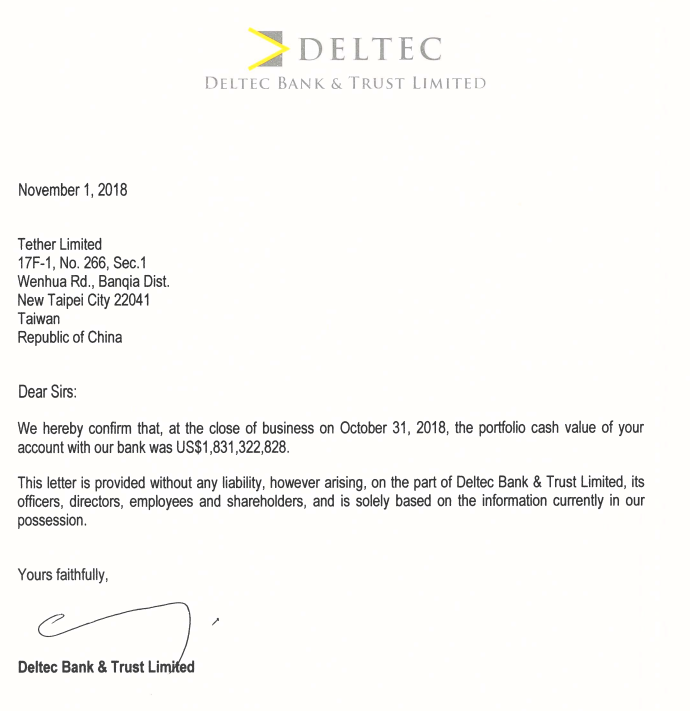 Most recently, Tether produced a letter on November 1st from Deltec Bank & Trust that allegedly confirmed Tether’s cash portfolio, but the authenticity of the letter was also heavily questioned. After nearly a week, the chairman of Deltec Bank & Trust has finally released a public statement confirming the authenticity of the letter and the existing relationship between the bank and Tether. The $1.83 billion dollars stated to be in Tether’s portfolio at Deltec is currently more than enough to back all of the USDT tokens in circulations on a 1-to-1 basis, as the circulating supply is approximately $1.77 billion. CoinDesk reports that Melanie Hutchenson, Deltec’s spokeswoman, hesitated to confirm the report due to legal complications in conjunction with the bank’s policies about client information. As an entity based in the Bahamas, Deltec could not simply disclose customer information “without the express or implied consent of the customer concerned”. In fact, Deltec were not authorized to freely divulge whether or not the said party was even a client or not. Thus, after confirming Tether’s intentions, chairman of Deltec Jean Chalopin told CoinDesk in writing that the “letter published by Tether is authentic”. Chalopin was baffled by the hectic media storm that followed Tether’s public release on November 1st, stating that there were “unfair attacks and unfounded statements”. “We live in a strange world where people can say anything they want about other people without proof or verification”, said Chalopin. How do you feel about Tether?